Mrs Young Sook Park produces luminous, fine-grained white porcelain in her studio near Seoul. Her work enjoyes a high reputation, because of her vessels. A determination to produce beautiful, technically demanding ceramics, finds expression in a series of plain white globular jars, formed of two thrown parts that are joined at the belly, which recall similar ceramics made in 18th century Korea. The excellent bond of glaze to clay achieved by Mrs Park imparts a gracious, refined beauty to her pots. Korean collectors and art historians have a strong emotional attachment to the moon jar, and Park's contemporary pieces are striking, modern evocations of the form. Fine moon jars have a special place in the affections of Korean people. They are thought to possess qualities of magnanimity and expansiveness that set them apart from other ceramics. 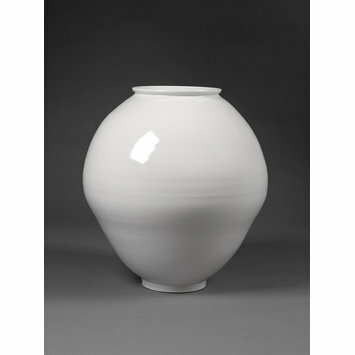 A large, rounded profile white porcelain jar. The high-fired ceramic body has been covered with a translucent, thin glaze that adheres beautifully to the clay. The vessel has a generous, curving profile, an out-turning lip and a short, straight-walled foot. 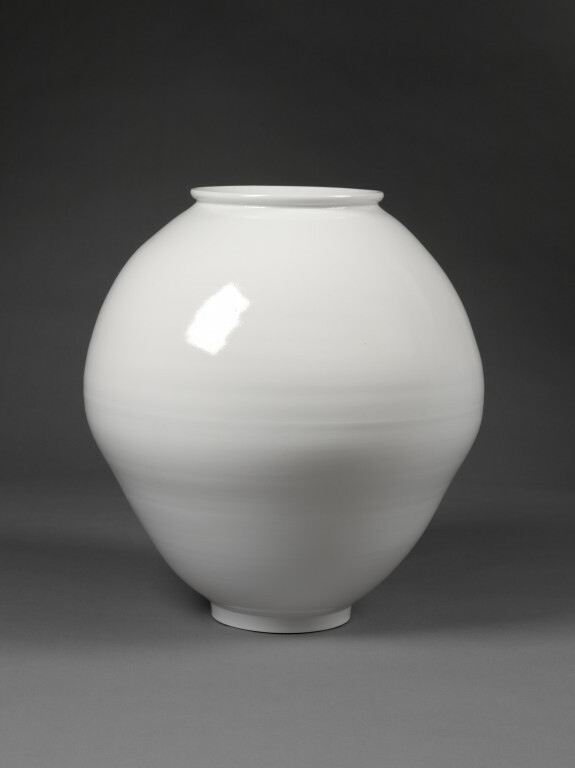 Porcelain jar, made by Young Sook Park, Korea, c.2008. Beth McKillop & Pauline LeMoigne "Tradition and Transformation : two decades of Korean Art and Design at the V&A Museum" in Orientations,Volume 43, number 6, September 2012, pp.83-91.